Leading Manufacturer of atlantis big hot and cold floor standing water dispenser and atlantis big normal and cold floor standing water dispenser from Noida. 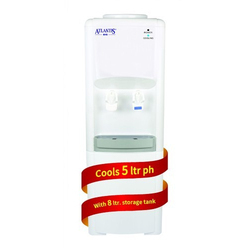 Atlantis Big Hot and Cold Floor Standing Water Dispenser dispenses hot and cold water and can be used with a 20-liter water bottle or the RO Filtration System. The high-efficiency compressor helps provide icy cold water on demand. This water dispenser also features an adjustable cold water thermostat. local appliance store. This will improve cooling and efciency. Drain the reservoirs before and after cleaning, when going on long vacations or if not using the dispenser for long periods of time. dispenser before performing this procedure. Dispense hot water until temperature drops to a safe level to avoidthe risk of scalding. Press all dispensing buttons until water no longer comes out. Place a bucket beneath the drain outlet on the back of the dispenser. and let the water ow into the bucket. the drain cap. Collect the water in a container, not the drip tray. clean the reservoir prior to ¿¿¿rst time use. dispenser cleaner or vinegar and wipe the inside of the reservoir. with 0.3 gal / 1 L of hot water into the reservoir and wait 20 minutes. always remove the bottle support funnel before pouring water or cleaning solution into the reservoir. Place bottle support funnel back on top of dispenser. with a clean cloth and do not touch the part of the unit that the water touches. Make sure the unit is unplugged and power switch is in the OFF position. The water bottle can be purchased from your local retailer. has a puncturable cap or sticker. Press and hold all dispenser buttons until water ¿¿¿ows from the dispenser. Plug in the water dispenser. optimum temperatures and is ready for use. Like most appliances, your new water dispenser requires periodic maintenance to operate ef¿¿¿ciently. Your water dispenser must be cleaned every 4 months. Please note that as per your warranty, routine maintenance of the dispenser is required. Failure to maintain the water dispenser will void your warranty. unplug the dispenser before performing any of the following cleaning procedures. The outside of the dispenser can be wiped clean with water dispenser cleaning solution or a mild soap and water. Never use harsh chemicals or abrasive cleaners. Rinse thoroughly with clean water and then dry surfaces. To remove, take the grill off the tray and ¿¿¿rmly lift the tray up, dislodging it from the guides. Drain and clean. The drip tray should be emptied and cleaned regularly to remove spotting and any mineral deposits. Clean with water dispenser cleaning solution or a mild soap and water. For tough deposits, add vinegar and let it soak until the deposits come loose. Then wash, rinse and dry thoroughly. To replace, put the grill back on the tray and slide the tray onto the guides.